Being trapped on an upper floor of a burning high-rise is the stuff of nightmares, but a product called SkySaver offers a last-resort means of escape, should that unlikely scenario occur and a safer exit is unavailable. 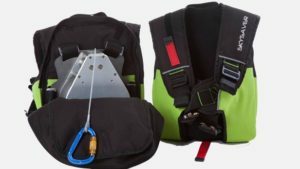 SkySaver is worn on the back like a backpack and allows the user to descend out of a window and reach the ground in one piece. SkySaver requires an anchor point be installed by a certified company, in most cases drilled into the wall above a suitable window. In an emergency, the user would put the backpack on, attach the integrated cable to the anchor point using a carabiner, pop out of the window and descend to the ground. SkySaver features a Controlled Descent Device which automatically unravels a fire-resistant galvanized steel cable at a steady rate of around 6 ft (1.8 m) per second. It’s rated for a minimum of 66 lb (29 kg) and a maximum of 300 lb (136 kg), though a child’s version is in the works, too.